the well known and well respected British pianist, John Lill talks about how important it is to be mentally and physically fit to give concerts on a regular basis, and how he manages that himself. He discusses his views on competitions, what inspiration means to him and how he often feels guided by a greater intelligence than himself in his performances. Some of his stories about noisy audiences are very funny. Why, he asks, when phones go off, or other noisy distractions, always seem happen in the slow movement? And how he had just given a concert in which, amazingly, a man’s wooden leg had fallen down from the dress circle into the stalls! Arguably Britain’s most well known pianist who has recently celebrated his 70th birthday with a highly acclaimed complete Beethoven Sonata Cycle at London’s Cadogan Hall and Manchester’s Bridgewater Hall, John Lill first came to international attention when he won the coveted Tchaikovsky award in Moscow in 1970. 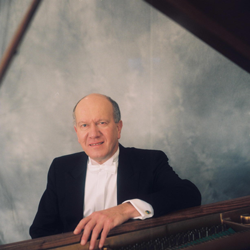 Known for his aristocratic interpretations of Beethoven and the great masters of the nineteenth and twentieth century piano repertoire, John Lill performs all over the world and was awarded a CBE in the 2005 New Year’s Honours List.